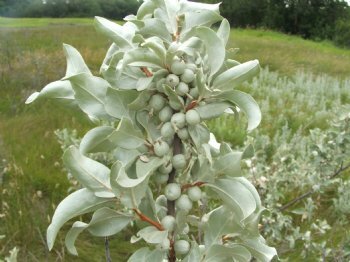 SILVERBERRY - a hardy, alkaline tolerant and drought tolerant and high PH sites shrub, reaching 5-9 feet in height, forming dense thickets for wildlife cover and song & game bird food. Flower is yellow with silvery outside tubes; fruit is egg-shaped and ripens in September to October. 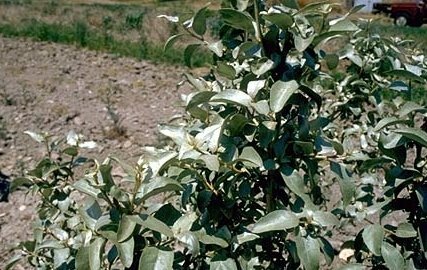 An excellent shrub for dry, exposed sites, often used in reclamation and slope plantings. Native to the Northern Plains and Canada. Self pollinating.